Formaldehyde is a naturally-occurring organic compound with the formula CH2O. It is the simplest aldehyde and is also known by its systematic name methanal. The common name of this substance comes from its similarity and relation to formic acid. Formaldehyde is an important precursor to many other materials and chemical compounds. In 1996, the installed capacity for the production of formaldehyde was estimated to be 8.7 million tons per year. It is mainly used in the production of industrial resins, e.g., for particle board and coatings. In view of its widespread use, toxicity, and volatility, formaldehyde poses a significant danger to human health. In 2011, the US National Toxicology Program described formaldehyde as "known to be a human carcinogen"
Scientists use the words “exposed” or “exposure” to talk about how people come in contact with a substance, such as formaldehyde. Some people are more sensitive than others, so an exposure that causes no problems for some people can make other people sick or uncomfortable. Some of these symptoms also happen with other upper respiratory illnesses, such as colds/flu and seasonal allergies, so if you have these symptoms we recommend that you see a doctor or another medical professional. If you are more sensitive to formaldehyde and are exposed to more of it for a longer time, you are more likely to have symptoms. If you are exposed to less formaldehyde for a shorter time, you are less likely to have symptoms, especially if you are not sensitive to formaldehyde. Formaldehyde is known to cause cancer. The cancer of greatest concern is cancer of the nose and throat. Scientific research has not yet shown that a certain level of formaldehyde exposure causes cancer. However, the higher the level and the longer the exposure, the greater the chance of getting cancer. Exposure to formaldehyde might increase the chance of getting cancer even at levels too low to cause symptoms. Formaldehyde is a common chemical that can be emitted from a number of products in the home. Smoking, pressed wood, and particle board have all been shown to be sources of formaldehyde. 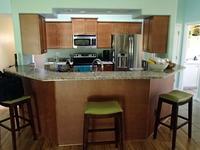 Higher formaldehyde levels are usually found in newer homes or homes with new construction. The levels decrease over time. Formaldehyde levels also increase with increases in temperature and humidity. Indoor Air Quality Solutions, IAQS begins every Formaldehyde assessment with an initial survey of the property using the Formaldemeter htV-M. Supplied with the htV-M download software. The htV-M can precisely measure formaldehyde concentrations in parts per million (ppm) and mg/m3 over a wide range of temperature and humidity. Fast and easy to use, pressing a single button gives an immediate indication of concentration levels. 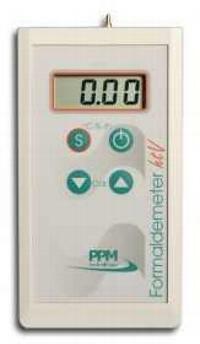 The improved Formaldemeter htV-M is reliable and simple to calibrate. The compact size means the htV-m is small enough to be used as a hand held device. The built in memory and real time clock enables the htV-m to log all 3 parameters and corresponding times, allowing improved monitoring and analysis opportunities. Alternatively a PC can automate the sampling and log data at specific times by a direct or wireless connection. This is advantageous as it allows the user more freedom and is a cost effective approach to taking such measurements. If indoor levels are identified a second level of sampling may be reccommended to validate the feild measurements. The sampling method used by Indoor Air Quality Solutions, IAQS is the Prism Analytical Formaldehyde sorbent tube and low volume air pump. 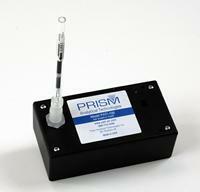 The analytical test method used by Prism for gaseous formaldehyde or for formaldehyde in water has been correlated or is compliant with the California Air Resources Board’s (CARB) § 93120, European DIN Standard EN-717 and ASTM methods D-5582 and E-1333. It has also been compared with DNPH testing used in NIOSH 2016 and found to be in good agreement. Ambient air sampling is done with our A14 formaldehyde sorbent tube and a 200 mL/min air pump. For formaldehyde levels in air below 1 ppm(v/v) a sampling time of 20-30 minutes (4-6L sample volume) is optimal. Sample time is 30 minutes (6L sample volumes) to prevent sample breakthrough on the tubes. Sample times exceeding 45 minutes (9L sample volume) may not be analyzed and a new sample may be requested. For formaldehyde levels that might exceed 1ppm (v/v) (industrial areas, embalming centers, histology laboratories, etc.) a sampling time of 5-10 minutes (1-2L sample volume) is adequate. Do not exceed a 10 minute (2L sample volume) for high levels of formaldehyde, to prevent the possibility of the instrument going off scale. The minimum detection limit for formaldehyde is <5 ng/L (4 ppb v/v).